(to read a general review of fluorescence cell counting, click here). CONVENIENT: The LUNA-FL™ is compatible with PhotonSlides™ and LUNA™ Cell Counting Slides. These disposable precision slides offer the ultimate counting experience with no mess or cleanup, while maintaining the highest standard of cell counting accuracy. for further analysis. 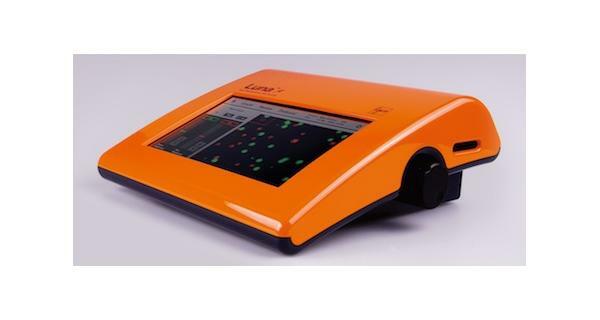 The LUNA-FL™ Dual Fluorescence Cell Counter is integrated with on-board flow cytometry type gating software. Be confident in the accuracy of your results by adjusting the threshold of fluorescence intensity. Once the LUNA-FL™ has counted your cells, you can check to see which cells were judged to be live or dead on the touch screen. Green and red circles indicate live and dead cells, respectively. that graphically shows live and dead cell populations. histograms are combined into a single PDF file and saved to an external USB drive.